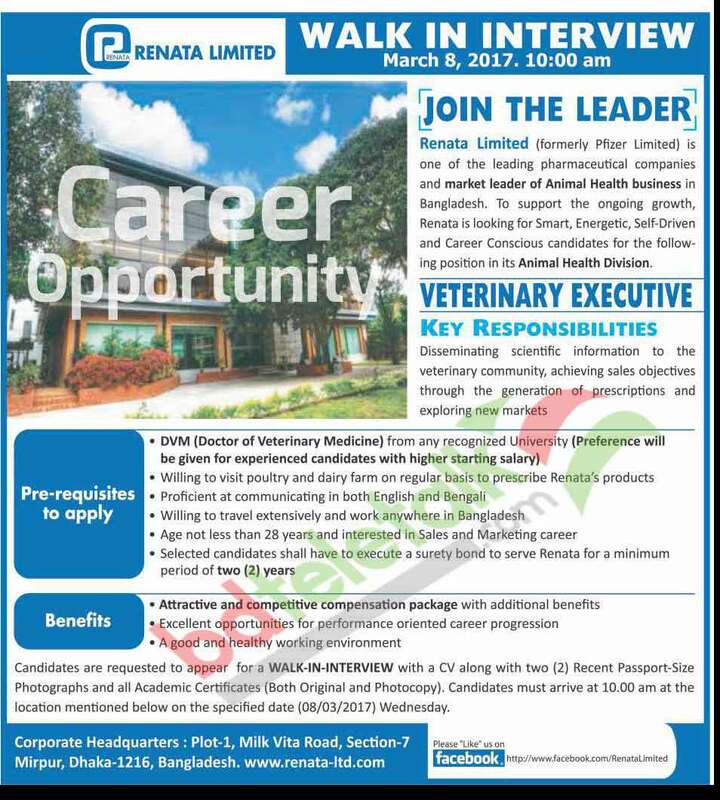 Renata Limited Job Circular 2017 "Veterinary Executive"
Renata Limited job circular 2017 publish on 2nd March on Prothom Alo and online jobs portal www bdjobs com. The leading Bangladeshi pharmaceuticals Renata Limited will recruit some personnel for the post of “Veterinary Executive” as walk in interview. Interested and eligible candidates should be present on that day at respective office with due time on 8th March 2017. Bellow you have to see the job details and eligibility qualification so far. For more details you may visit Renata Limited official website at www renata-ltd com. Renata Limited is one of the leading pharmaceutical companies and market leader of Animal Health business in Bangladesh. To support the ongoing growth, Renata is looking for Smart, Energetic, Self Driven and career conscious candidates for the following position in its Animal Health Division “Veterinary Executive”. Disseminating scientific information to the veterinary community achieving sales objects through the generation of prescriptions and exploring new markets. Willing to visit poultry and dairy farm on regular basis to prescribe Renata’s products. Selected candidates shall have to execute a surety bond to serve Renata for a minimum period of two years. A good and healthy working environment. Candidates are requested to appear for a Walk in Interview with a CV along with two recent passport size photographs and all academic certificates (Both original and photocopy). Candidates must arrive at 10:00 am at the location mentioned bellow on the Specified date (08 March 2017) Wednesday. Corporate Headquarters : Plot-1, Milk Vita Road, Section-7 Mirpur, Dhaka-1216. Bangladesh, www.renata-ltd.com. I want a marketing job,pls someone give me a job emergency.